September is right across the corner and, while we're really producing several new stories, most of them are still very far away from any clear publication date, except for Casanova-AVARITIA, the new arc which starts coming out NEXT WEEK, but Bá is drawing this arc, not me. 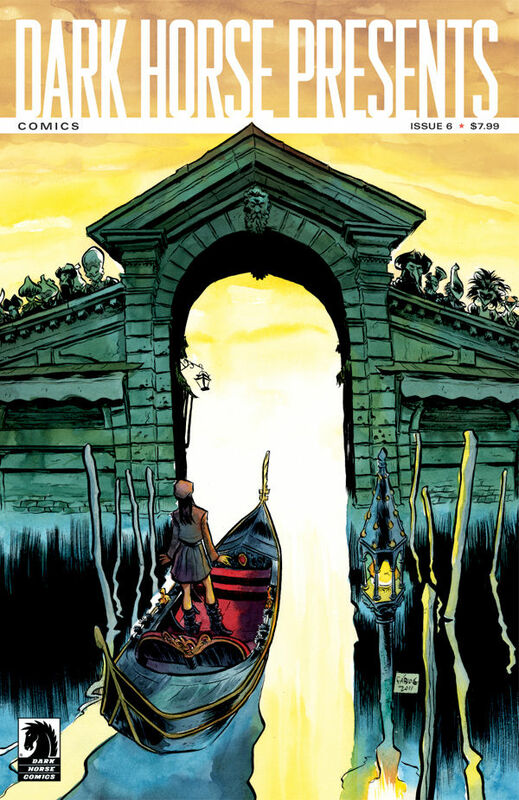 So, with that in mind, I'm doing a story for issue 6 of the new Dark Horse Presents anthology. This is the only new story I'm writing and drawing which will be published this year in the US, and it's only 8 pages long. I gave my best to make each page count. I received the invitation to create a new story shortly after I did the variant cover for issue 2, so I can say the original inspiration for the story came from that cover - or from the idea which inspired that cover - but it went on a completely different direction. A better one, if you ask me. I never forget how important Dark Horse Presents was for my brother and I, how in it we discovered Sin City and Hellboy, how in its digital rebirth a few years back I did Sugarshock with Joss Whedon (for which I got an Eisner Award) and how it still publishes and celebrates creators with a personal voice. I'm thrilled to think that in this issue my story is in there's also a new Jill Thompson story. This issue only comes out in November, but it never hurts to give people the heads up. We've been meaning to change the visuals of our blog for quite some time, and today we decided it was time to skip working on what we were supposed to be working on - a three page story for a brazilian anthology, the script for one of the new things we're now writing, new Casanova pages from this new script Matt sent and some other things - to write a little code, choose some images and give our site, its blogs and our web presence a face lift. This is the forth time, in more than 8 years, that we changed how this blog looks, and I hope we can keep it the way it is now for another good chunk of our lives, as we're getting further and further away from the modern and current web-design technology, and it's getting harder and harder to do this all by ourselves. In the past few years, we ended up dividing our web presence in all these several social medias, from Flickr to Youtube to twitter and facebook, leaving around images, videos, other links and several words and thoughts born on the heat of the moment (and only written in these other virtual places), so I hope the links on the side bar are helpful for those trying to keep track. I'll be happy if it makes it easier for me. I fished these images from 2004, when we redesigned the blog for the first time. I still like how simple and effective these animated gifs are, and maybe I'll put some new ones on here from time to time. Just before I go, I like to leave here an update I think we already said in all those other social medias: since they cancelled the Wizard World Los Angeles, we won't be traveling to the US this year anymore. We, like many, had made plans for that convention, for another chance to get to know L.A a little more and maybe see some of our friends who live there, but I guess this will have to wait. The positive side of this is "more time to write and draw new stories", which I think it's what we all should focus on. Thanks once again for another moment of unforgettable joy. This has indeed been an amazing trip. Happy together around the world. 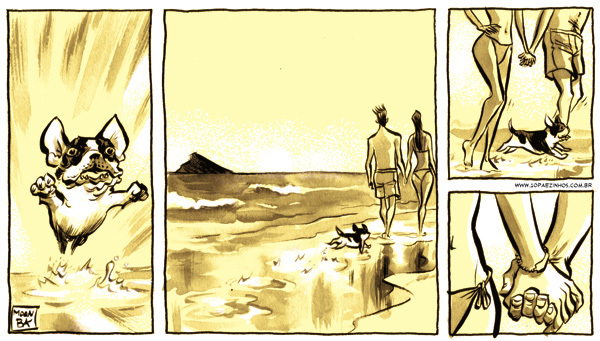 After our great time in San Diego this year, crowned by the Eisner Award we received for Daytripper, we returned filled with the creative energy contained in all works of love, and it was great to come back home with that feeling that the stories we tell are being read. We had a great time inside the convention on our super booth with the always great company of our talented booth babes - Becky Cloonan and Jill Thompson - and our faithful and hilarious brazilian companions Rafael Albuquerque, Gustavo Duarte and Marcelo Braga. Outside the convention, the great hang out place and creative outlet was of course the Tr!ckster store and bar, where the new generations met the old, where comics were praised, studied and respected, and where we created art in all its forms. In all our 15 years of SDCC, it's always this kind of energy that keeps us coming back, and this time the Tr!ckster was the place to find that energy - and to pass it around. Back in Brazil, there's always a lot to do, and right now the final preparations for the release of the brazilian edition of Daytripper are being made, but already we are on a new trip - to AFRICA. We're in Luanda right now, capital of Angola, as guests of Luanda Cartoon, an international comics, animation and cartoon festival, and it's great to see how our work is understood in other portuguese-speaking countries. We crossed the Atlantic and yet, here we feel somewhat at home, sharing the same dreams, the same inspiration and the same difficulties. We still have some days here in Angola, let's see what else we can discover as every day here is an adventure. In the end, every day can be an adventure, no matter where you are, if you have the spirit and the heart for it.